The International Existing Building Code (IEBC). The IEBC may be available for free viewing on the web somewhere, but it is not easy to find. The IEBC is almost identical to the California Existing Building Code which is available for free viewing (see below under "Standard Plans"). ICC Publication #4020S09 Order the Shear Wall Construction Guide directly from the ICC website. Cover is shown at left, second from top. The second edition of the Shear Wall Construction Guide is 180 pages long, with over 150 illustrations and photos. Chapter 6 introduces residential earthquake retrofits. The Shear Wall Construction Guide addresses many field conditions and obstacles encountered in shear wall construction. It also includes information on collectors, openings through shear walls, wood shrinkage, and other topics related to new or retrofit construction. Features a very useful color-coded chart showing common hazards to look for; chart gives references of where to find more info (many of which are listed here). Current format is essentially Power Point slides; this is a good review if you attended the seminar, but without accompanying discussion it is unlikely a reader will learn retrofit methods by reading the materials alone. Contains good examples of some common mis-applications of hardware to avoid. An expansion of prior FEMA documents, especially with respect to wood-framed buildings. Chapter 5 applies to residential construction. This is the first FEMA (or related) publication I have seen that includes information on how to retrofit "balloon framing." The link above is for Part 1 (containing Chapter 5). FEMA P 50-1 "Seismic rehabilitation guidelines for detached, single-family wood-framed buildings" (Chapter 2 only). Chapter 2 of FEMA P 50-1 shows limited installation methods for residential earthquake retrofits. The information presented is mostly the same as found in FEMA P-547. As of November, 2012, FEMA P-50-1 is not readily available on the Web; this PDF of Chapter 2 is provided at www.quakecheck.org as a public service. The following “standard plans” are either identical to, or minor variations on, information presented in the International Existing Building Code (IEBC). The IEBC is based on early recommendations from FEMA. California Existing Building Code, Appendix Chapter A3 Essentially identical to the IEBC. This is the free version of the code, in a format intended to annoy you into buying the print copy. ABAG—"Standard Plan A" (usually called "Plan Set A") (PDF, 24" x 36" format) Consists of two full-size 24” x 36” drawing sheets. Limitations for Los Angeles "Standard Plan One"
Various regional guides published jointly with local agencies. Overview of seismology, shaking maps, fault locations, emergency preparations. Customized for several regions. As of November, 2012, they all show the wrong direction to turn a gas supply valve to close it (although many gas shut-off valves can be turned either way, some cannot; check yours before the quake). Putting Down Roots in Earthquake Country--Central US (PDF, 25 MB) Read about the New Madrid Earthquake starting on page 4. Note: Print these out or become familiar with them BEFORE the power goes off in a disaster. New edition released in 2010 or so. Excellent overview of geologic considerations, behavior of various high-rise and commercial building types, and residential hazards (such as hillside homes) to look for. Mr. Yanev has decades of experience in analyzing earthquake risks and designing strengthening measures for all kinds of facilities and buildings. 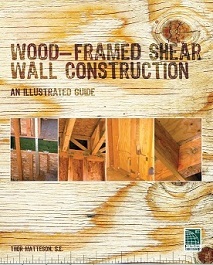 This book illustrates basic residential retrofit measures similar to those in other publications listed above.